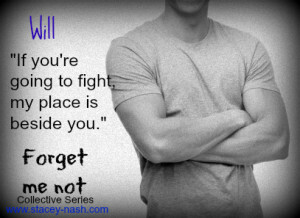 This saturday there won’t be a non-book content post, but a blog tour post. I had this one already scheduled before I started the non-book content posts on saturda. 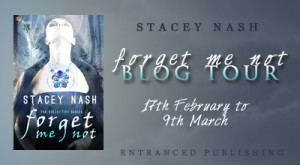 Today is my stop during the blog tour for Forget Me Not, the first book in the Collective series by Stacey Nash, There is some information about the book, an excerpt, an awesome guest post by Stacey Nash about how she came up with the names for her characters and a tour wide giveaway! For some reason I am really interested by how authors come up with the names of their characters, so I asked Stacey for a guest post about how she came up with the names for the characters in Forget Me Not. You know, I think Shakespeare had it dead right in this quote from Romeo and Juliet. I couldn’t think of my characters with any other name than those they have now. I think if I had of given them different names, they wouldn’t have the same personalities and traits. Naming them wasn’t always easy or a conscious choice either. My method for naming characters is a little haphazard and different for each character. I had characters who named themselves, characters whose names were supposed to come later and characters whose names I put a lot of thought into. 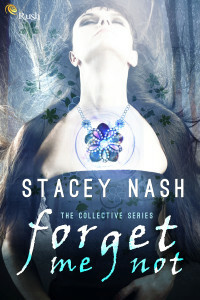 There are four major characters in Forget Me Not and each of them were named using a different method. Anamae or Mae as she’s known by her close friends was the hardest character to name in the entire book. 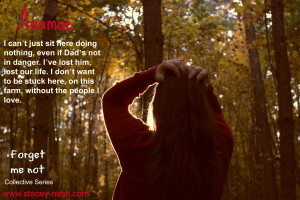 She’s the main character and I knew I wanted her name to be Mae before I started writing, but I also knew that I wanted it to be a shortened version of her name. Because when the story starts she’s sweet, lonely, and a little bit innocent, so I wanted a name that represented that. But Mae is more indicative of the person she is toward the end of the story; strong, independent, and certain. I spent a lot of time searching for a name that was the right fit and I never found one. Then one night my hubby was getting his fix of Japanese cartoons, AKA Anime, and Anamae was born. Will: It’s funny; this strong, protective, lovable boy next door was never meant to be called Will. When I first wrote the story I researched names on baby naming sites and there was nothing I liked. Nothing that jumped out and said this! This is his name. Possibly it was so hard because he already had a fully developed personality. Frustrated at not finding his name, I just used the name Will as a placeholder while I wrote the story. I’m not sure how it even became a place holder, I just wrote and the name Will appeared on my screen. When I reached the end of the story and went back to revise it, I just couldn’t change his name. He was Will now and I couldn’t think of him as anything else. Jax: As a character Jax is a bit of a conundrum. I knew he was coming, he, Will and Anamae were all fully formed characters before I started writing. I had explored their personalities and knew who they were, but I didn’t stop and actually name Jax until I reached the point where we find out his name. I knew he needed a strong name and I wanted a short name that was only one or two syllables, so off to the baby naming sites I went. The second I saw it, I knew that was his name. 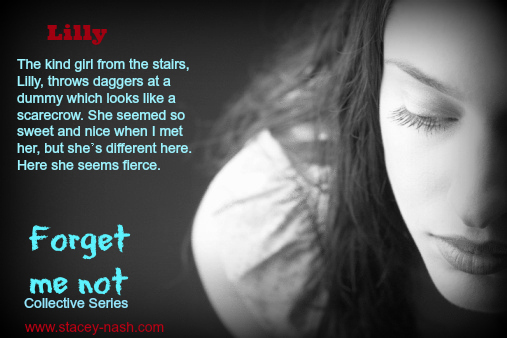 Lilly: She’s another character who showed up in the story fully formed. She bounded into her first scene with a vibrant personality and introduced herself to Anamae straight up with a “Hi, I’m Lilly.” I don’t know where the name came from, but there was no way it could change. Some of the older characters were a little more tricky and none of them came into the story already named like my younger, main characters did. For these characters I used baby naming sites and searched for popular names in the year and region the character was born. Mae’s dad is named Richard because he’s in his late thirties and Richard was a popular name in America during the late 70s / early 80s. So I guess overall it can be said that my character all came by their names differently. 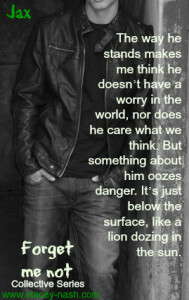 A huge thanks to Lola for having me on her blog today, and to you guys for reading. Thanks for stopping by Stacey :). 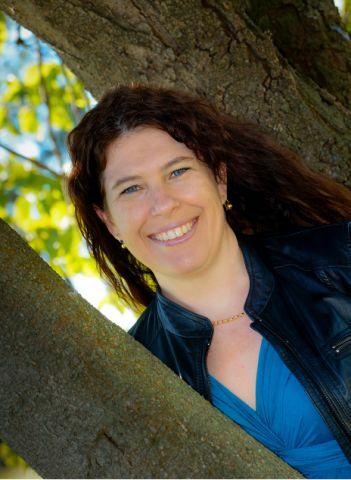 And I really enjoyed reading your guest post about how you came up with the names for your characters!